The Julian calendar was a reform of the Roman calendar which was introduced by Julius Caesar in 46 BC and came into force in 45 BC. The content of this article provides interesting history, facts and information about life in Ancient Rome including Julian Calendar. Most people have heard of the expression "Beware the Ides of March" , but what or when were the Ides of March? The date of the Ides of March was the the fifteenth (15th) of March. The day of the month that the ides fell on was dependent on the complicated system of calculation in the Julian calendar which Julius Caesar himself established. This relates to the way that Roman months were divided. In marking the days of the month they went backwards: thus, January first was the first of the kalends of January, December thirty-first was pridie kalendas, or the day next before the kalends of January - the day before that, or the thirtieth of December, tertio kalendas Januarii, or the third day before the kalends of January, and so on to the thirteenth, when came the ides of December. January from Janus *** February because the people were then purified, (februabatur) by an expiatory sacrifice which was believed to atone for the the sin of the whole year - this was anciently was the last month in the year. Numa, in imitation of the Greeks, divided the year into twelve lunar months, according to the course of the moon, but as this type of division did not correspond with the course of the sun, he ordained that an intercalary month should be added every other year. Julius Caesar afterwards abolished this intercalary month, and with the assistance of Sosigenes, a skilful astronomer from Alexandria. They arranged the year according to the course of the sun, commencing with the first of January, and assigned to each month the number of days, which they still retain. This is the celebrated Julian or solar year on which the Julian Calendar was based, and has been since maintained without any other alteration than that of the new style, introduced by pope Gregory, A. D. 1582, and adopted in England in 1752, when eleven days were dropped between the second and fourteenth of September. The use of clocks and watches was unknown to the Romans - nor was it till four hundred and forty-seven years after the building of the city, that the sun dial was introduced: about a century later, they first measured time by a water machine, which served by night, as well as by day. The day was either civil or natural day. The civil day was from midnight to midnight whereas the natural day was from the rising to the setting of the sun. Sunday from the Sun *** Monday from the Moon *** Tuesday from Mars *** Wednesday from Mercury *** Thursday from Jupiter *** Friday from Venus *** Saturday from Saturn. 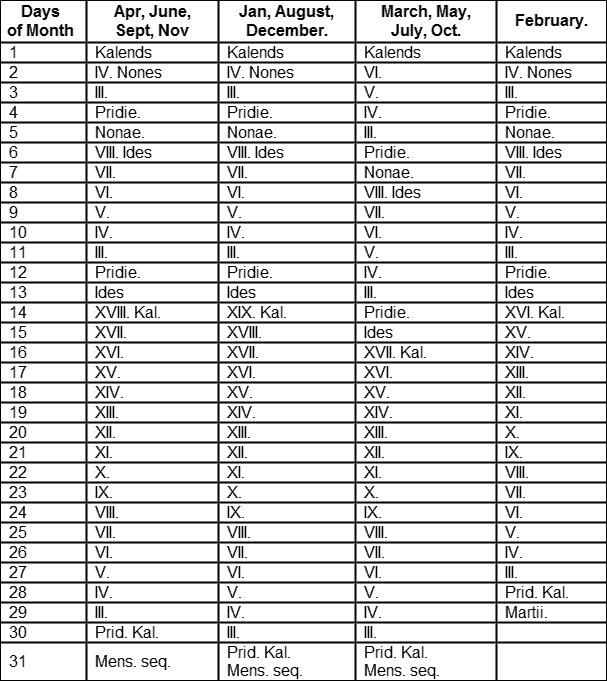 The following Table of the Kalends, Nones, and Ides. The content of this Julian Calendar category on life in Ancient Rome provides free educational details, facts and information for reference and research for schools, colleges and homework. 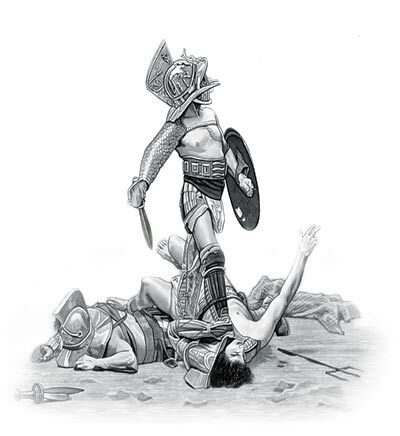 Refer to the Colosseum Sitemap for a comprehensive search on interesting different categories containing the history, facts and information about Ancient Rome.